High-retention HDMI connections that are certified to provide premium, error-free performance. This 2-meter HDMI cable has been tested in accordance with the Premium HDMI Cable Certification Program. This ensures it's able to deliver the newest technical features that the latest HDMI specifications have to offer, including enhanced resolutions and protection against EMI interference.The cable features high-retention HDMI connectors that fasten firmly inside each port. This helps to prevent accidental disconnections and signal loss.Each cable is labeled with the Premium HDMI Cable authentication, so you can be confident that you are purchasing a high-quality premium cable with guaranteed performance.The cable supports resolutions of up to 4K@60Hz (3840x2160p) and bandwidths of up to 18Gbps. It also supports HDR (High Dynamic Range) for higher contrast ratio and vivid colors.With higher resolutions, increased speeds, and sharper images, you can expect an enhanced video experience. The cable is guaranteed to provide the very best HDMI capabilities available today. 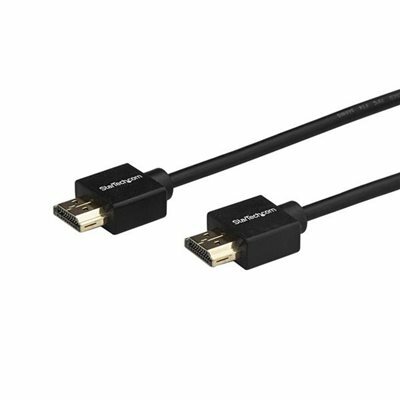 It's the perfect cable for creating the ultimate home theater or for providing lifelike digital signage.Plus, the cable also supports up to 32 uncompressed digital audio channels to provide crystal-clear sound. The cable is also backward compatible with previous HDMI specifications and will work with all of your existing HDMI devices.The gripping HDMI connectors are ideal for high traffic applications or in environments where vibrations could cause accidental disconnects and picture loss. It works great with wall-mounted equipment and in situations where equipment is frequently moved.Plug the connectors inside the HDMI ports and the connectors will automatically latch to the inside of the port, there are no special screws or accessories required. The grips will create contact pressure inside the port and ensure that the connectors don't loosen over time.The cable has undergone rigorous compliance testing and is certified by an HDMI Authorized Test Center to ensure it supports the high-bandwidth enabled features it promises. An EMI test is also performed to ensure the cable minimizes interference with wireless signals.